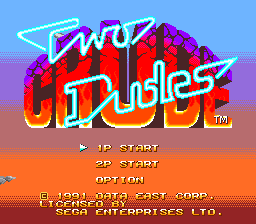 Two Crude Dudes, known as Crude Buster (クルードバスター) in Japan, is an arcade action-sidescroller developed by Data East. It was brought to the Sega Mega Drive in 1991. The soundtrack was ported by Hitoshi Sakimoto. Some sound effects are identical to the ones found in Verytex and Midnight Resistance, games he also worked on. jumps, is for punches and kicks and is for grabbing objects and enemies. Controls can be remapped in the options screen. The protagonists can throw around rocks, billboards, cars etc. without breaking a sweat. Compared to many other games in the genre, physical attacks have low damage ratings and very poor reach, aside from jump kicks. Therefore throws and and jump kicks should mainly be used, which can be confusing at first. The game has a total of 6 stages. All enemies must be defeated in order to progress. A boss awaits at the end of each stage. The player may choose from three difficulty levels. On higher difficulty settings, more enemies appear, while damage ratings are unaffected. The color palette is brighter and more saturated, some of these changes are due to palette restrictions (e.g. player character and many enemies sharing the same palette), while others (e.g. sky color) seem deliberate. The vendor machine bonus stage is new. It was a fixed cutscene in the Arcade release. The enemy transporter helicopter has been replaced by a flying barge. ROM space restrictions or sprite amount issues could be a reason for this. Possible censorship: A Santa Clause type enemy has been colored purple instead of red, mutant dogs have blue hair now instead of brown. The PAL version is not region protected and runs at full speed when forced into 60Hz mode. The game does not however change into "Crude Buster" when setting the console's region to Japan. Main article: Two Crude Dudes/Magazine articles.